Android App Archives | Androidability | Android tips, tricks, and technology for better ability. 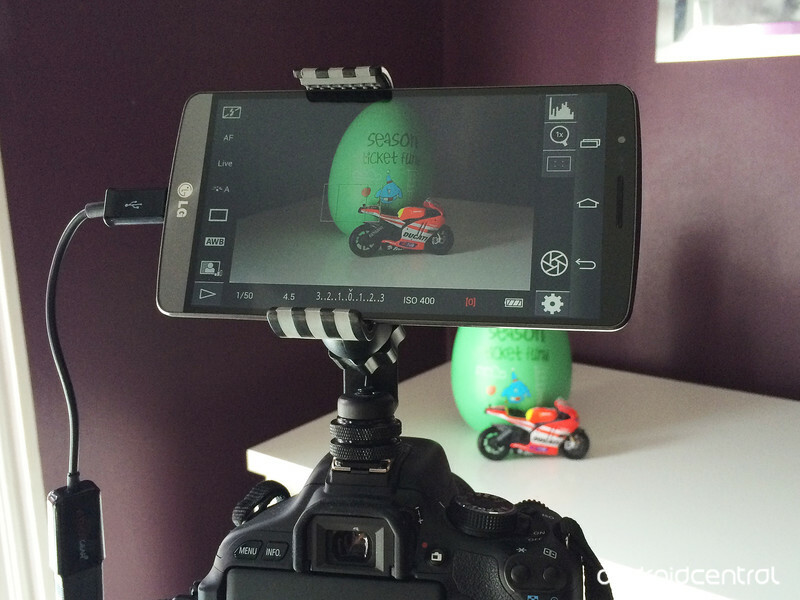 A little while ago we looked at using an Android phone with a DSLR and how the experience was actually pretty good. Using the Chainfire app with a Canon DSLR opens up a world of possibilities. Before we looked at importing your DSLR photos, but there’s more to it than that. With a cheap accessory on top of this you can actually create a low-cost, yet still effective external monitor for your camera. What we’re basically looking at is a phone grip, similar to something you might use in the car to hold it to the windshield. Instead of a suction cup, though, we’ve got a hotshoe mount to fix it to the top of a camera. Again, as with the last time we looked at using the Chainfire app with a camera, you’ll need a USB OTG connector and a miniUSB cable to connect to the camera. The beauty of adding a grip to the top of the camera is that you can easier use the app while you’re shooting. It also gives you a bigger display to look at over the one on the camera – made bigger still if you opted to go down the tablet route – and one area I found this set up particularly useful is when trying to shoot video using the DSLR. With no auto-focus on offer on the camera, having the Chainfire app connected allows you to change focus points by touching the screen instead of using the cameras manual controls. It’s not perfect but it’s certainly useable. There are other apps out there too that will let you interact with your DSLR – including none Canon brands – from your Android device, which is great, but buying a cheap accessory to clip it to the top of the camera is one of the best thing’s you’ll do. The popular Snapchat app has been updated with new features but they’re not switched on by default. Here’s our guide on enabling new options like filters and using the new Snapchat. 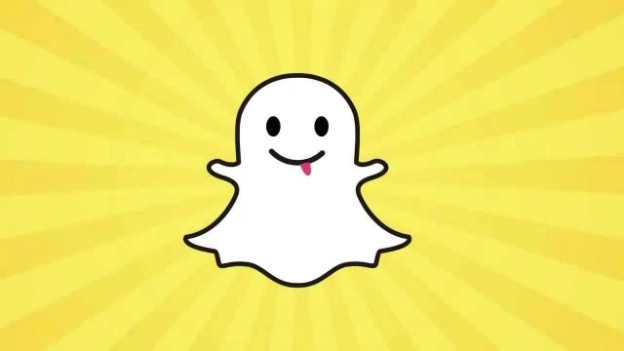 See also: Snapchat users get new year hack: 4.6 million phone numbers revealed. If you fancy chatting to a friend, swipe right on their name in your Snapchat inbox to begin. When you leave the chat screen, messages viewed by both you and your friend will be cleared. The app will notify you if your friend is online when chatting, and if you’re both chatting at the same time you simple have to press and hold to share live video. In similar fashion to Instagram, Snapchat has filters which you can add to your photos. However, they’re not switched on by default so here’s how to switch on filters in Snapchat. Once you’ve taken a photo, simple swipe left or right and you’ll see a message which says ‘turn on filters’. Click the ‘I want filters’ button at the bottom of the screen. This will take you to the ‘additional services’ part of the settings menu where you can tick the filters box. Note that you’ll need to enable location to be able to switch them on and for some to work properly. Chances are that you know what a flatbed digital scanner is. You’ve probably even used one to make digital copies of documents or photos. What would you do, however, if you need something scanned, yet a dedicated scanner isn’t nearby? Well, using your smartphone instead is an option – just take a picture of the paper that you need digitized. Or just get one of these apps made especially for the purpose. There’s a ton of “scanner” apps, most of which are available for free, and in this post we’ll introduce you to some of the best among them. CamScanner is one of the most popular mobile apps for “scanning” documents, notes, business cards, and so on. It is also extremely rich in features. The app can automatically straighten, crop, and enhance the taken image in order to make it more presentable and easier to read. Scans can be saved as JPEGs or as PDF, whichever suits your fancy. Registered users may take advantage of cloud storage space for storing and sharing scanned documents. Those who upgrade to Premium ($4.99 per month, or $40 per year) may take advantage of the app’s OCR abilities, which converts scanned images into editable text documents. 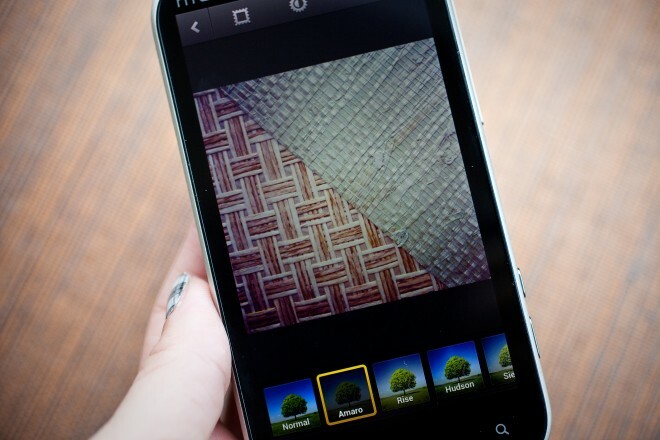 If you’ve noticed that Instagram on your Android handset has been unusually sluggish lately, you’re not alone. Many of us have noted an unfortunate combination of slower feed load times and an uptick in overall bugginess. Quitting and restarting occasionally fixes the problem, but there’s a far easier way to deal with a misbehaving app. Just go into Settings > Apps, and then clear the cache . Voila, the app should be back to 100 percent. Of course this doesn’t just apply to Instagram. Clearing cached data for any Android app should be your first course of action when problems arise. This will wipe out the temporary files that may be responsible for the trouble, and it can also have the added benefit of saving space on your handset. Who needs Touch ID? Thanks to a new Android app, you can unlock your smartphone with a touch of your finger for free. ICE Unlock is a brand new Android app that uses your phone’s front-facing camera to scan a high-resolution image of your fingerprint. From there, you can use your fingerprint as verification to unlock your phone, functionally the same as Touch ID. And, for emergencies, you’ll need to have a backup pin ready, so you won’t ever find yourself locked out of your phone completely. ICE claims to be a true biometric scanner for Android. Rather than touching your fingerprint to the screen, you’ll be unlocking your phone using the front facing camera again, which will match your fingerprint map with the template they have stored (which you provide initially). Your fingerprints are stored locally, not on central servers, for a little added privacy reassurance. ICE Unlock is available now for free on Google Play. There’s no denying it — many people will need extra motivation to get up at a reasonable hour after sleeping in during the holidays. It’s a good thing, then, that Pandora has just given its Android app the alarm clock and sleep functions that reached iOS nearly a month ago. Most of the functions are the same. 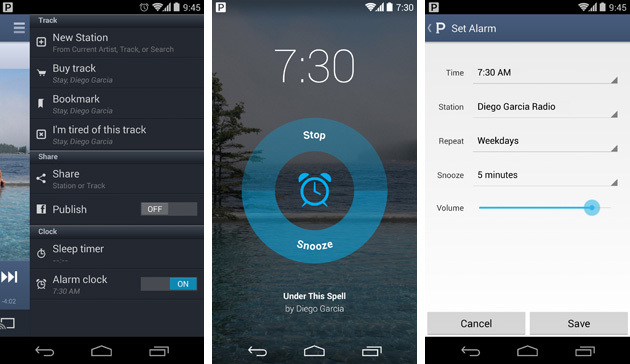 You can still tell Pandora to wake you up to your favorite streaming station, and you can hit the snooze button if you’re not quite ready to greet the new day. Android users do get a few OS-specific perks, including support for recurring alarms and the luxury of switching apps once the alarm has been set. If you need some tunes to make the early morning a little more bearable, you’ll want to swing by Google Play to grab Pandora’s update. Have you ever cleared your notifications by accident and deleted things that you hadn’t checked out yet or wanted to keep for future reference? I know that I have. I open up the notification pane and before I can even think about it, WHAM, notifications have been cleared. But what about that message or e-mail? Which app was it from? Well, we’ll show you how to check out your notification history so you don’t have to worry about notification purgatory. Video conferencing is not exactly something new to mobile devices. In fact, when 3G was first introduced to GSM networks, video-calling was the most-touted feature. Sadly, devices like the Nokia N90 and even the cheap LG KU250 “3G for all” did not end up popularizing video calling. While carriers theoretically supported video-conferencing through 3G networks, this was a poorly-marketed effort that was ahead of its time. Fast forward to the era of smartphones, tablet computers and fourth-generation technologies. Today’s IP-based communication can more easily carry video calls with ease. iOS users have it easy, because FaceTime is built right into the iPhone, iPad, iPod touch and Macs. Higher-resolution FaceTime cameras ensure smooth video conferencing, which is especially enjoyable at fast connections.